Head of the Russian Presidential Administration Sergey Ivanov believes Russia and the US have different approaches to global security issues. The head of the Russian Presidential Administration says currently he sees no prospects for a Russia-US missile defence deal. At the same time, Sergey Ivanov assured in an interview that his country would adjust to the shift in the international balance of forces. “The configuration of the world security forces is changing and we must take this into consideration. Ant this is what we do, both in planning and in the development of new weapons systems. This is the only way,” Ivanov told the Komsomolskaya Pravda daily. Ivanov, who held the Russian Defence Minister’s post in 2001-2007, acknowledged that Russia and the US have different approaches to world security issues. “We are surrounded by a raging sea of threats and problems. These are Muslim fundamentalism, North Korea’s nuclear device, for sure, and also we have Iran that is developing its missile technology. I am not saying that they are our enemies, but we must take this all into consideration,” the Russian official noted. The head of the Presidential Administration also pointed out most countries possessing small- and medium-range missiles were gathered around Russian borders. “They cannot reach America, but they can very well reach us,” Ivanov said. “But if we approach this issue in a broad and systematic way, we will see a real problem and this problem is a hard one. We have a crawling spread of missile technology. And let us not deny it, it is happening around our borders, not around the American ones,” he told the newspaper. Currently Russian-US talks on missile defence are at a stall as Russia demands legally-binding obligations that the missile defence will not target its forces and thus will not lead to the shift in the strategic balance of forces. The United States says its European missile defence systems is planned against ‘rogue states’ such as Iran and North Korea, but refuses to give Russia any legally-binding guarantees. Russia repeatedly warned that it would undertake countermeasures if the US missile defence plan continues. 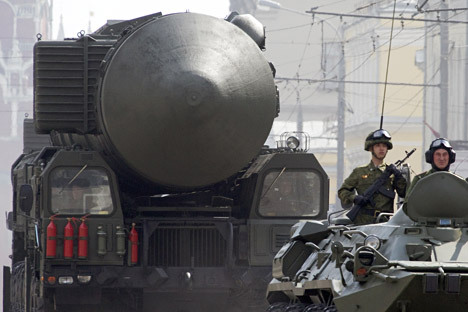 Russian authorities have already ordered the deployment of short-range missiles to the country’s westernmost region of Kaliningrad, rendering partially useless the East European part of the missile defence system.